Hungarian Hebraist; born at Szenicz 1778; died at Budapest Dec. 29, 1852. 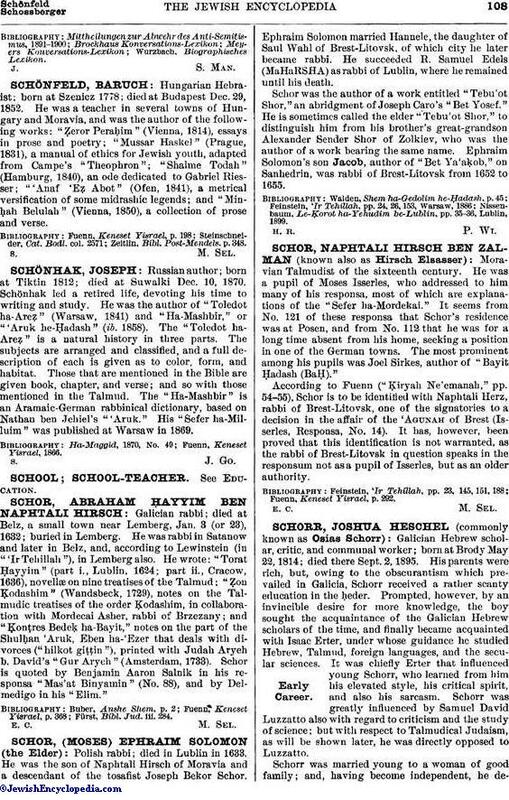 He was a teacher in several towns of Hungary and Moravia, and was the author of the following works: "Ẓeror Peraḥim" (Vienna, 1814), essays in prose and poetry; "Mussar Haskel" (Prague, 1831), a manual of ethics for Jewish youth, adapted from Campe's "Theophron"; "Shalme Todah" (Hamburg, 1840), an ode dedicated to Gabriel Riesser; "'Anaf 'Eẓ Abot" (Ofen, 1841), a metrical versification of some midrashic legends; and "Minḥah Belulah" (Vienna, 1850), a collection of prose and verse. Zeitlin, Bibl. Post-Mendels. p. 348.